Image optimization is a most important part of SEO. In this tutorial i shared basic idea of optimizing images for SEO. The basic step of your SEO campaign is Image SEO. When search engines starting indexing your blog page, the not only focus on your content. They also look up at your images. SEO friendly images is most important of your blog for better search results. Sometimes one better image as well present your product or content, 10 descriptions can not do this job successfully. Optimize images for web or your content may archive better search ranking. The most important factor of onpage optimization is image optimization. Images are a strong visual component of a webpage. They say that a ‘Picture is better than a thousand words’. Day by day Blogspot blogger users are increasing. They also make a powerful and strong blog using blogger. But a more number of users are not aware in Blogger Search Engine Optimization (SEO). In above i already said that, SEO is most important for every blogger or website and image optimization is a big part of SEO. 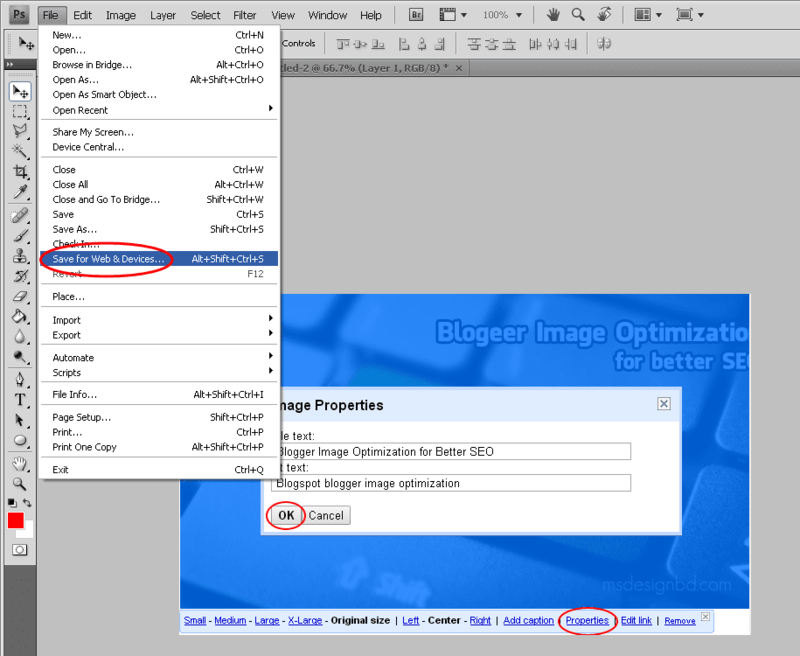 In this tutorial i shared all part of blogger image optimization. Carefully follow below all steps. Make sure your image is renamed with your post title. It is most important for indexing your page fast. Avoid using default image file names like, “DSC00213.jpg” as it does not give much information about the image. Use descriptive file names with keywords separated by “-” (hyphen). For example, “image-optimization-for-SEO.jpg”. Always try to use PNG (Portable Network Graphics) format image in your blog. Image relevancy is important and important when it comes to image optimization for SEO. An image of a train on a page related to Ferrari will do you no good. I know its common sense but this step is so important that I just can’t miss it out. Use right and well relevance image in your every post. Then search engines's robot and user can easily understood about your post. The alt tag and title tag of image is most important section of Image optimization. The text that used in the alt tag is displayed in place of the image if the image can not be shown or is taking too long time to load. Text title or text tag is for search engines robot. When search engines robot indexing your page then robot can understood about your image's title tag. Image size can increase your page load speed also. Image size in image optimization is very crucial. Image compression will be with any offline software or may in online image compression. After the recent Panda update, the loading time of web pages has become a vital part for your SEO ranking as the total time of visit has become more important as a SEO algorithm. That's why always try to use low bytes images in post page like under 50 KB. You may also optimize your image in online. 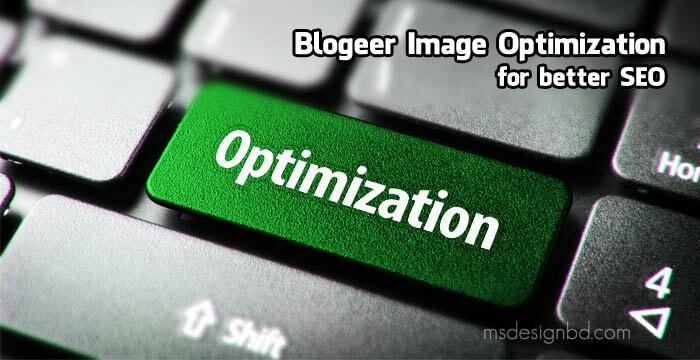 In internet many web image optimizer is available. If you are using photoshop for make your post image then, obviously use "Save for Web" option. This option helps your for make your image size low with full resolution. In above step we discussed about image size. Yeah! low bytes image is for better for every web page. For optimizing image using photoshop you must use this option "Save for Web". It may help you for better optimized image. I think this tutorial may help all newbie blogger. If you have any question about this tutorial, then feel free to describe your question in comment section. You may also ask your any question about your blogger SEO. That's it. i always Image optimization by alt attributes. read this post I have further been save for web in photoshop. you're most welcome. Stay with us. Thank You very Much. Your each and every article gives me about new things to know in every time. That's why I am a regular reader of you, and love to come back here again and again. This information is very useful for ranking and other thing because google does not read image , thanks for giving right information . Amazing Tips... Thanks for this information.